A.F.C. 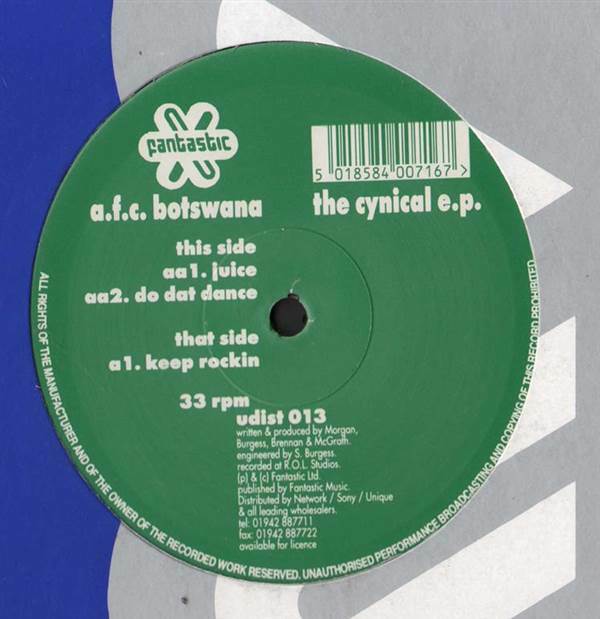 Botswana - The Cynical E.P. 12"
BREAKS, Fantastic, UK, 1995... Breaks, House with Keep Rockin, Juice, Do Dat Dance. Koller & Plante - Falling 12" Wayward Soul - 1999 12" Various - Mystic Brew - The Flavour Of Fat City (Disc 2 Only) LP Bomb The Bass - Beat Dis 12"
Joy Foundation - Luv You Baby 12" Various - History Of Our World (Disc 1 Only) 10" Ils - The Next Level / Music 12" Lilo - Everything 12"